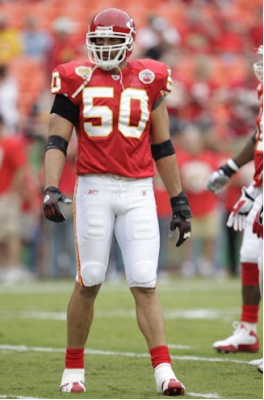 Chiefs linebacker Mike Vrabel may take a fascinating stat line into retirement — if he ever retires. Vrabel, who is in his 14th N.F.L. season, caught a 2-yard touchdown pass in Sunday’s 35-31 loss to the Texans. It was the 12th reception of his career, and all 12 were for touchdowns, including two in the Super Bowl with New England — against the Panthers in 2004 and against the Eagles in 2005. Sunday’s 2-yard score matched Vrabel’s career long, such as it is. But he also has a 13th touchdown, a 24-yard interception return against the Panthers in 2005 that, in one play, surpassed his career receiving total (17 yards).